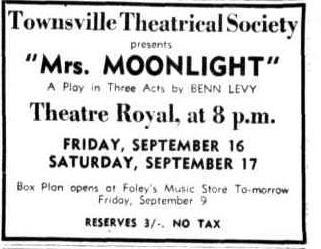 Townsville Theatrical Society players appear to have hit the mark with their latest production, 'Mrs. Moonlight.' This show will be staged again, to-night. The society's shows have always had the polish that puts them on a par with capital city stage productions; you won't find better entertainment of this class in Australia.